The move follows a trend among technology firms and other corporations, including eBay, of splitting their businesses into separate companies, based on the belief that tightly focused firms perform better. "The split will provide each new company with the independence, focus, financial resources, and flexibility they need to adapt quickly to market and customer dynamics, while generating long-term value for shareholders," said HP Chief Executive Meg Whitman. 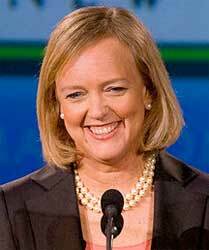 "In short, by making the transition now from one HP to two new companies, created out of our successful turnaround efforts, we will be in an even better position to compete in the market, support our customers and partners, and deliver maximum value to our shareholders," she said. The project, set to be completed by the end of fiscal 2015, will take place as a tax-free distribution of shares to HP's stockholders. Whitman will serve as Chairman of the PC and printer business, dubbed HP Inc., and Chief Executive of the separate Hewlett-Packard Enterprise company, the statement said. "Dion Weisler, an executive in the PC and printer operation, is to be Chief Executive of that streamlined business," the report said. HP has been undergoing a massive reorganisation to cope with the move away from traditional personal computers to mobile devices. The company said in May that it was cutting between 11,000 to 16,000 jobs on top of 34,000 reductions planned under a cost-cutting programme that started in 2012.